Post originally written in 2016, updated in 2019. We got a new addition to our family for Christmas and I’m so excited to share the news with all of you. It’s a girl, and she’s adorable. You’re probably thinking a puppy or a kitten, but nope. Not a baby either! For Christmas, I got an iRobot Roomba Vacuum. We named her Maude. And I love her so much! Maude is such a super welcome addition to our family. She joins us and our dog, a Golden Retriever. If you have a dog – especially a golden – you’ll know why Maude’s arrival was like something from heaven. Every day Maude turns herself on, announces herself to the room, not unlike an actual child, and vacuums my entire downstairs. In fact, my floors are being cleaned right now and I am not having to do it. While she’s cleaning I have more time to cook and bake! 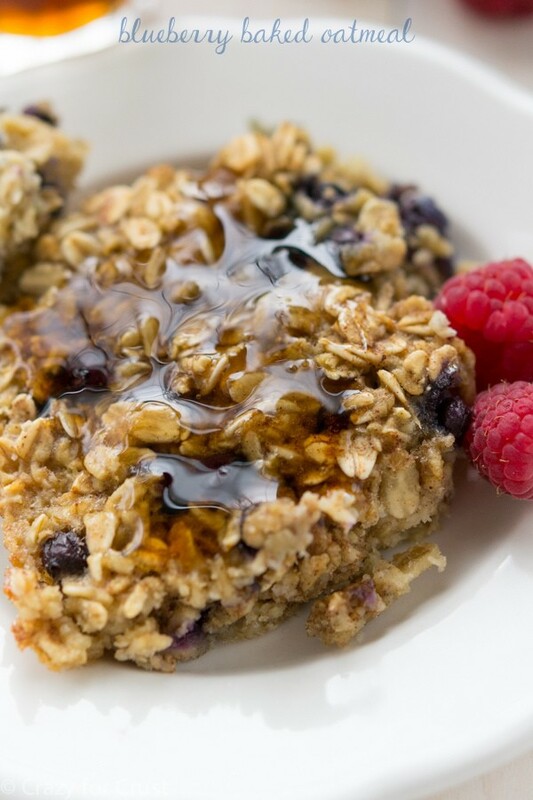 Baked Oatmeal is one of my favorite easy breakfast recipes. It tastes sinful but it’s healthier and so much better than plain old cereal. Maude and I are still getting to know each other. She’s not perfect, but hey, who is? Sometimes she runs for 10 minutes and then docks herself and I think, What the heck? Stay up too late and now you’re shirking your responsibilities? Or sometimes she gets so tired while trying to get unstuck from under the dining room table that I have to go rescue her. <–That one is pretty funny. Plus, having something else vacuum for me frees up my time so I can do other things I love, like workout and create new breakfast recipes that I can enjoy as a second breakfast. I’m all about the second breakfast, as you all know. I’m not hungry at o’dark thirty when we have to leave for school and the gym so I just drink a quick smoothie, but I’m starving after. And while I’d love to live on banana bread (even the healthier kind), sometimes a girl has to eat her oatmeal. 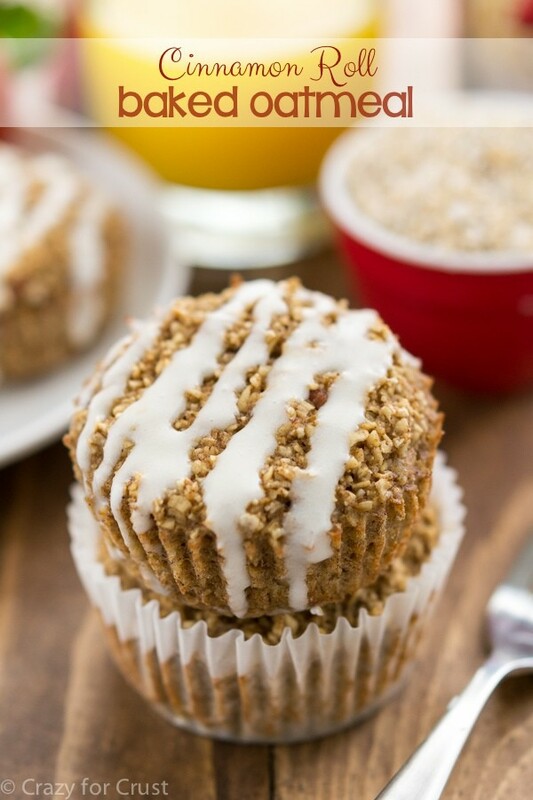 This recipe is similar to the other baked oatmeal recipes I’ve made, one with blueberries and one that makes individual muffins. It’s one bowl, easy, no mixer, and you bake it. 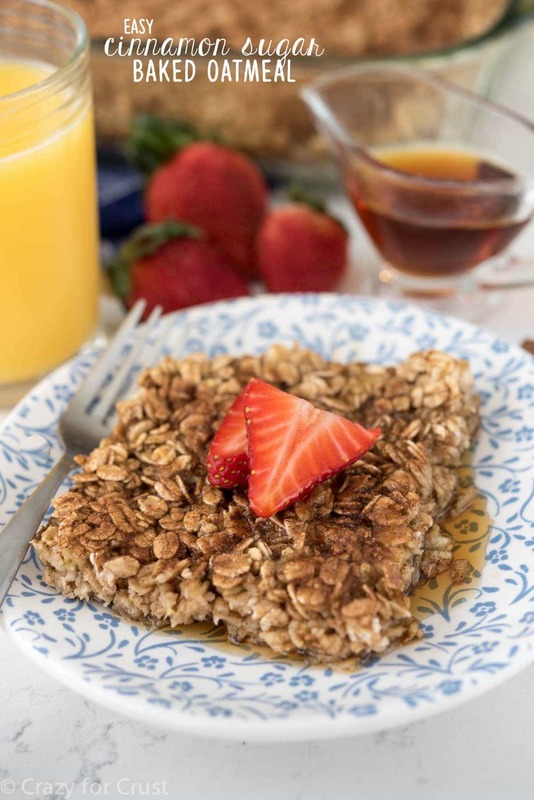 The texture is not like your normal oatmeal – I do not like regular oatmeal but I love it baked! It’s kind of like a soft granola bar when you bake it, and it’s not mushy at all. Can you make oatmeal in the oven? Heck yes you can! It tastes so much better than regular oatmeal. Warm from the oven this baked oatmeal is sweet and chewy and everything breakfast is asking for. This recipe was meant to be kind of like snickerdoodles married oatmeal: the pan of oatmeal is sprinkled with some cinnamon sugar before baking. It’s still a pretty healthy breakfast though – there’s no oil and not much sugar baked into it. Slice and serve it with syrup (sugar-free, if you’re reducing that sugar intake) or just serve it with berries and/or some yogurt. Then, because it’s in bar form, you can slice it and freeze it for easy mornings. I use regular old fashioned oats in this recipe, but you could use instant steel-cut (like I did here). I use almond milk almost exclusively in my oatmeal, but you can use nonfat cows milk or any kind of dairy-free milk (like cashew or soy). I used mashed banana in this version, but you can use an equal amount of unsweetened applesauce if you prefer. Made as directed this recipe has only 135 calories per servings. 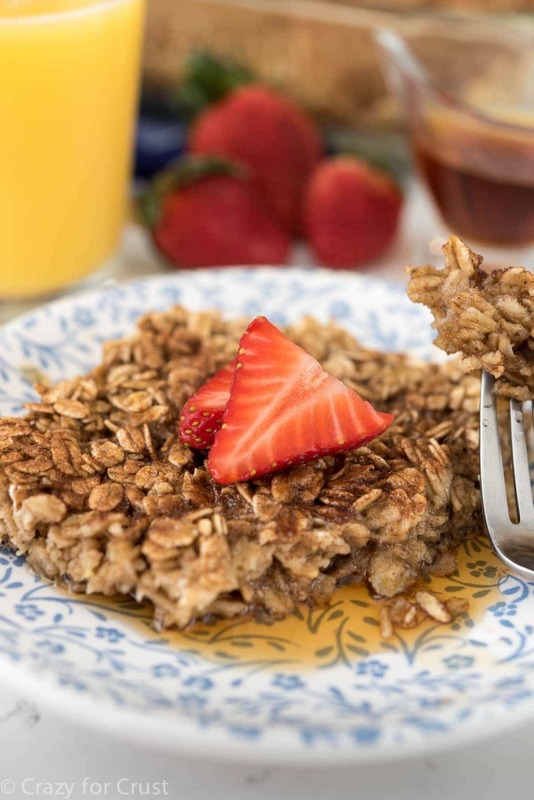 Enjoy this Cinnamon Sugar Baked Oatmeal as an easy breakfast. It’s delicious plain or with fruit! This oatmeal is such an easy breakfast recipe! Make Cinnamon Sugar Oatmeal from scratch for a healthier breakfast that lasts all week! Whisk eggs, mashed banana, brown sugar, and vanilla until smooth. 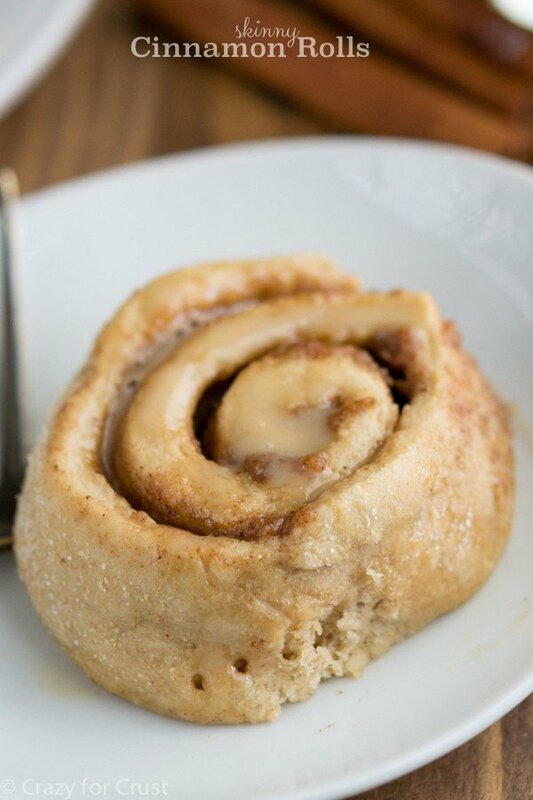 Stir in 2 teaspoons cinnamon, salt, and baking powder. Stir in oats and milk. Spread in prepared pan. Stir 1 tablespoon granulated sugar and remaining 1/2 teaspoon cinnamon. Sprinkle over unbaked oatmeal. Bake for 28-34 minutes until oatmeal is browned and not jiggly in the center. Cool slightly before serving. Serve with syrup and/or fruit or vanilla yogurt. Do you know of any substitute for the banana? I try to eat low glycemic index/low carb. Oatmeal does ok, and I can use a brown sugar substitute, but bananas spike my sugar ? Can I substitute Brown Sugar with either Agave Nectar or Natural Honey? Thank you.